Ever wished that you could command orders at your TV like a confident starship captain? Or that you could witness a picture so ridiculously realistic, it compels you to reach out and touch what’s in front of you with your own bare hands? Or maybe you’ve wished to own a screen that’s so ‘ginormous,’ it engulfs over half of your living room on game day? Well rejoice, fellow binge watchers – the future is here. Meet the Samsung UN105S9 in all of its glorious technological splendor. Completely equipped with state of the art curved flat screen engineering, smart TV capabilities, and full 3D viewing availability, this is a television experience you won’t want to miss out on! 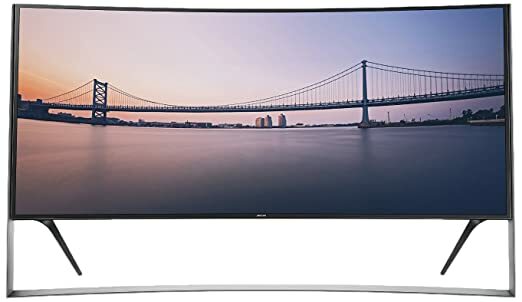 Its breathtakingly beautiful display is guaranteed to immerse you into 105 inches of sweet Ultra HD goodness. Smart TV functionality enables voice and motion control capabilities once thought to exist only in science fiction. And with inputs that include four HDMI 2.0 slots, one Ethernet connection, and 1 and 2 Component In receptacles, you’ll be ready for anything that life throws at you. Well, except for the random space rock that might fall into your screen. But that can be easily be evaded with your keen starship prowess, right?